Oleo International, a trading name of T A Savery & Co Ltd, is a leading expert in energy absorption technology. Oleo has been producing energy absorption solutions for over 60 years and has over 1,000,000 units in circulation worldwide. In April 2015 the company was awarded the Queen’s Award for International Trade. 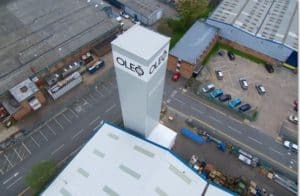 Oleo recently constructed the world’s tallest elevator buffer testing tower at its headquarters in Coventry. Elevator buffers sit at the bottom of an elevator shaft and are a vital last safety mechanism in the unlikely event that all other safety mechanisms fail. They work by absorbing the impact of the free falling elevator, saving the lives of the elevator’s occupants. The 32 metre tower allows the company to conduct tests on buffers designed for the high speed elevators installed in the world’s tallest buildings. The tower has already enabled Oleo to manufacture the world’s largest hydraulic elevator buffer. At 15 metres tall, the buffer can absorb the impact of an elevator travelling at 20 metres per second. Recognising the testing tower was an industry first, Oleo’s Marketing Manager Sandy Andringa wanted to record its construction to use in marketing activity. She commissioned freelance film maker Paul Duffy of Diamond Ocean, who had worked with the company previously, to investigate camera solutions. Paul had a very clear brief: he was looking for a camera that could be used in two distinct ways. 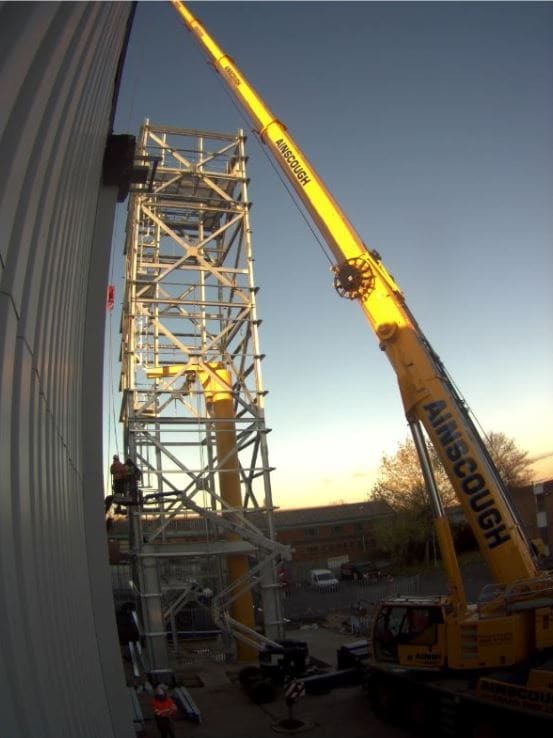 Firstly, a fully weatherproofed camera needed to be installed externally to produce footage that could be used in a time lapse film showing the tower’s construction. Once construction was finished, that camera, along with two additional cameras, needed to be installed inside the tower so they could be used in a testing capacity. This would enable Oleo’s technical team to examine each elevator buffer test and, in the case of a problem, pinpoint exactly when it occurred and have access to valuable data to help solve it. The key requirement for the external camera was that it could capture every element of the tower’s construction from top to bottom without needing to be repositioned. Given the tower’s height of 32 metres, this represented quite a challenge, although Paul soon realised that if a camera could be positioned in portrait orientation rather than the more typical widescreen landscape view, it would give the pictures required. The key requirements for the cameras inside the tower were that they should give solid reliable performance at low light levels, because the tower does not have any windows. Once Ecl-ips had been contracted by Oleo, Ecl-ips’s technical team and Paul carried out camera and software tests to ensure the hoped-for results could be achieved. In the end, a 5MP camera was selected. This was mounted vertically and precisely positioned to give the best possible view of the entire construction site. Once the camera had been deployed, Paul downloaded the images from the camera every 24 hours. He supplemented the footage with footage from additional mobile cameras when other views were required and used them to create a time lapse film of the entire process. When construction was completed, the original camera was repositioned inside the top of the tower where the footage can be used to check the view from above. Two new 2MP cameras were positioned further down the tower where they can be used to check the quality of the test. As products of varying heights are tested in the tower, both new cameras are mounted on remotely-controlled, motor-driven pan/tilt units to allow more precise framing of each item under test. The cameras are proving very effective, giving the Oleo technical team all the information that is needed during product testing.